I made a drum and I am so proud of it. 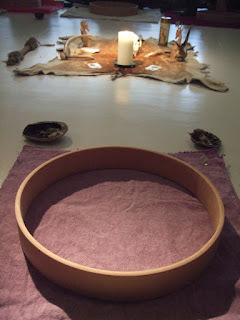 I’d been wanting to make my own drum for years – and finally signed up for a wonderful drum birthing ceremony run by Heron Drums at Aho studio in East London, which took place last Saturday. It isn't the first drum I've owned - although it was a bought one. Sadly, a dog ate it at a pagan camp. While I was off ritualing in the woods, a stray dog got into my tent and ate my drum skin (as well as the sausages I was planning on cooking for supper). After that I decided I was going to wait to replace it until I found the perfect one for me. I looked at loads of drums being offered for sale, but they were never quite right. In the end I decided I needed to make my own – but that goal sat unachieved on my list of New Year Resolutions for several years running. Then, back in January, I saw an advert for Heron Drum’s workshop and I knew I had to sign up. The day exceeded my expectations. There were 10 people in the class apart from the teacher, Jonathan Weekes. After Jon cast a circle and we had all introduced ourselves, there was a drumming session using drums similar to the ones we were about to make. 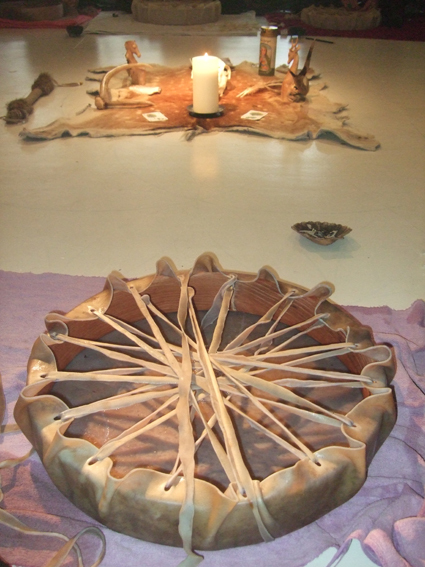 Jon then talked about the history and use of drums in shamanic practices. This was followed by another drumming session and a practical demonstration of how to make a drum. All the drums were made with ethically sourced birch wood frames and hides from stag, reindeer or horse. I chose a stag hide. 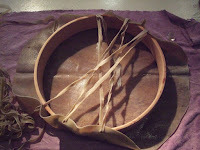 The lacing was done using a long strip from the same skin, so the drum holds the spirits of a single animal and single tree. When we had all finished, Jon led us on a shamanic journey to connect with the spirits of our drums. Everyone's experiences on the journey were personal, but there was a sense that we were all connected as a kind of family through the day and the ceremony. The workshop is called a drum birthing ceremony rather than just a drum making class. 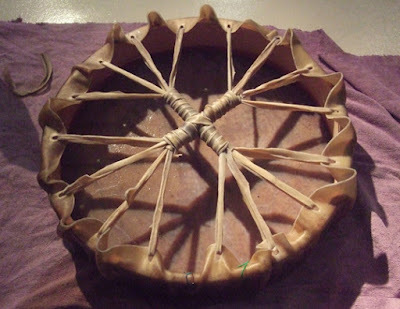 It was a powerful experience and I really did feel a much stronger connection to the drum I had made than I would have had if I had bought a finished instrument. It seemed as though we were each bringing something new, alive and unique into the world. New drums have to be left for seven days to dry properly before they can be used. I’ve still got a couple of days to wait, but I’m so looking forward to hearing my drum for the first time and starting out on the drumming journeys I know we are going to make together. Stray dogs are going to be kept well away from this drum. The photos show my drum at various stages during the process of binding the hide to the frame. Thats wonderful ,are you going to paint it ? , some of the shops in Glastonbury have some that are lovely. I'm going to scry into the skin, then decide whether to paint it or not. For a little while at least I will keep it natural in order to do scrying.